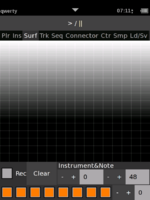 Signal Applications To Any (Audio for now) Network is a program for sound and music creation and composition. Plug-in based system for sound generators and effects. Create networks of machines and effects graphically. Use the touch-screen to tap your rythms and melodies. Or use the built-in tracker. Supports both directly generated sound and samples. Export patterns from the tap-interface to the tracker. Support configuration of the tap-surface' X and Y axis. Connect the Y axis to the cut-off control of the low-pass filter. Add a more point-click friendly replacement to the tracker. SATAN was originally created by Johan Thim and Anton Persson, the "NG" code base was created by Anton Persson and Ted Björling. Currently maintained and ported to the OpenMoko by Anton Persson. The code is licensed under the GPL. Share and enjoy!